Most people who visit Foz do Iguaçu, Brazil, head straight for arguably one of the world’s natural wonders: the magnificent Iguassu Falls. It is the biggest attraction by far in the tri-border region (Brazil, Argentina and Paraguay) and rightfully so. The massive volume of water and the thunderous roar of the falls leave every visitor awestruck within moments. However, Foz do Iguaçu has a little gem to offer, just across the road from the main entrance to the Iguassu Falls Visitor Centre: the Parque das Aves, or the Bird Park. 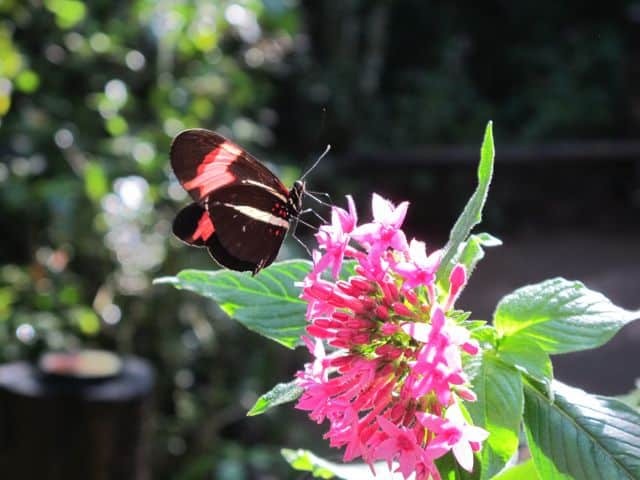 The Bird Park is home to a multitude of rare birds, colourful parrots, toucans and flamingos, alligators, snakes (including the anaconda) and gorgeous butterflies, in a natural jungle setting. 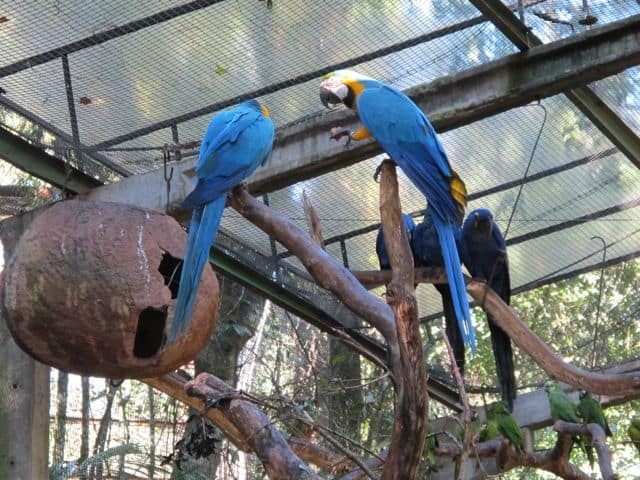 Allow me to introduce you to some of the colourful inhabitants of Parque das Aves. 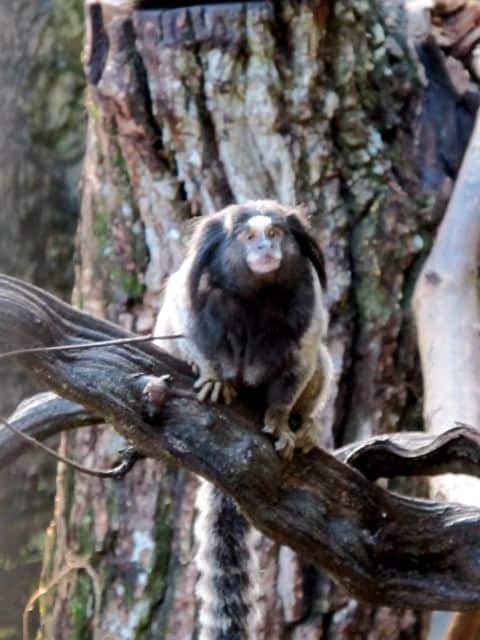 As you enter the park, you’ll come face-to-face with this cute little fellow: a black tufted-ear marmoset. Follow the trail past aviaries with gorgeous blue parrots to the flamingo enclosure. You’ll soon find yourself looking eye in eye with some of the cutest, most colourful toucans! The trail continues through the jungle under a cool canopy of trees. There are ponds with caimans and tortoises as well as various aviaries with more gorgeous toucans. 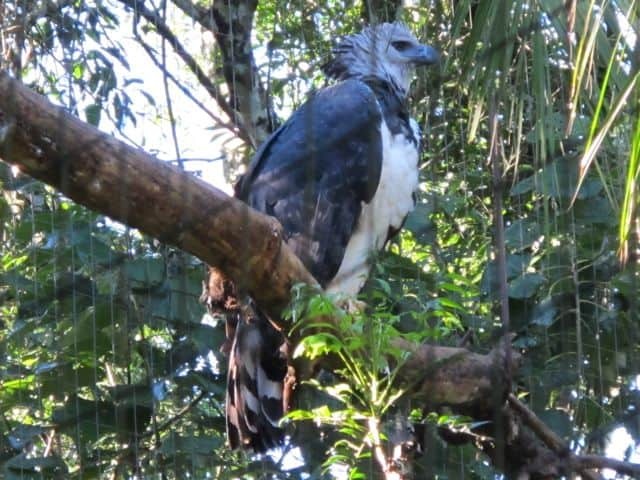 Take the trail that leads to the Harpy Eagles. These eagles are the largest and most powerful raptors on the planet and destruction of their habitat has led to near extinction. It’s truly an awesome experience to see these fearsome birds. The trail then passes the enclosure with cranes before continuing to the home of the golden parakeet. This crane came by and showed off its awesome wingspan! A branch of the trail leads to one of my favourite aviaries: hummingbirds and butterflies! I stood there for quite a while, being very still to take some good shots of the amazing hummingbirds. They’re not only a visual delight, it’s incredible to hear them zoom around in the air. The equally swift butterfly was a tad harder to photograph. This one stuck around for a few seconds! The trail ends at the parrot aviary, where lots of them fly up and down. The colours of these birds are simply bewildering. This couple showed off their colours with great pride! If you’re visiting the Iguassu Falls, I highly recommend a leisurely stroll through the Parque das Aves to admire the birds and support their preservation. You’ll love it! A big thank you goes to Loumar Turismo, the premier tour operator to the Iguassu Falls, and Hotel Bella Italia for hosting me in Foz do Iguaçu. Nice shots of the hummingbird Keith! beautiful birds Keith, and what a great shot of the hummingbirds, wow! When I was in Suriname I saw a lot of macaws (blue and yellow parrots) fly around…it’s stunning to see them in the wild. I totally loved the toucan-pics as well! loved the article..
Keith, I LOVE these photos – great shots of the toucan! Birds are always tricky for me to photograph (well, the smaller ones) – they’re so twitchy! Love the shot of the hummingbird, too! And the marmoset is soooooo cute! Basically, I want this place to be my garden. I visited a park like this in Costa Rica, it was just as beautiful. I love the pictures. Oh & I think the most amazing bird is the hummingbird. I love how they just float around in the air and then float still in front of a flower. Every time I see one I think of the summers I spent at my grandparents house in Mexico. Iguassu is insanely good, but I never made the Brazilian side. Stayed in the Sheraton Argentina…god I miss that place!